We love this great feature in the New York Times of Door 10 sound designer and company member Ben Williams' terrifying sound design for Julia Jarcho's new play, The Terrifying. Now playing at Abrons Art Center. We're honored to announce that Artistic Director Lily Whitsitt has received an Lower Manhattan Cultural Council Process Space Residency for Door 10 to continue developing This Is the Color Described By the Time in Summer 2017. More headphones! More Gertrude Stein! 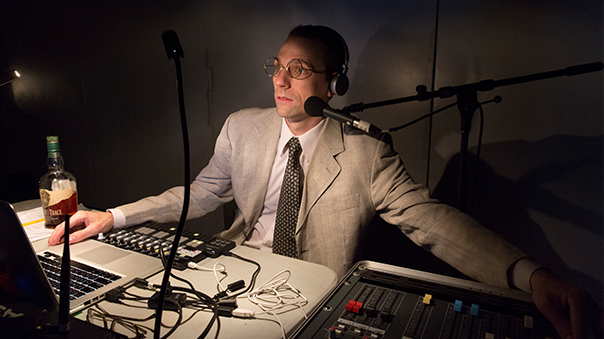 Sound designers Jim Dawson and Ben Williams, along with director Lily Whitsitt, continued developing This Is the Color through a residency at New Georges this month. One of Door 10's projects, "Breathing Room," hasn't been born yet - but we're honored it's included in Creative Capital's On Our Radar online database. Check out all the great projects included here. Artistic Director Lily Whitsitt is Co-Producer for The Fixer, which stars Dominic Rains, James Franco, Melissa Leo, Rachel Brosnahan and Thomas J. Ryan. Read the Variety article here. Thanks to all those who came out to see what we've been up to during the last two weeks of our Princess Grace Foundation-USA supported residency at BAC. We're looking forward to continuing to develop this piece. (Photo: Richard Termine). We are having a blast at the Baryshnikov Arts Center where we've just started a two-week residency. We're developing our newest work, This Is the Color Described By the Time, adapted from an early Gertrude Stein play. Sound designers Jim Dawson and Ben Williams are hard at work. Door 10 recently participated in the new Curie City pop-up performance series in Warsaw, curated by Joanna Klass and taking place in an old butcher shop. Door 10's Lily Whitsitt directed Karolina Szczypek's short play One in Seven, with Joanna Drozda, Piotr Polak and Joanna Krol channeling Oriana Fallaci, Susan Sontag, Sarah Kane, Leni Riefenstahl, and Diane Arbus.